The tournament is played at the PGA National Champions course. The course has bermuda grass greens (the first appearance of bermuda grass greens in over a month) and is most notable for the amount of water hazards the golfers will navigate this week. At least four holes require shots to be played over water where it will be directly in play and several other holes have water in play left or right of the green. In the finishing four holes, there are two par 3s with shots entirely over water and a par 5 where going for the green requires a shot entirely over water to a difficult pin. Relative to average, the course depresses driving distance, greens in regulation, and scrambling. The tournament has been held at the PGA National since 2007, meaning past data is limited. Only 17 players in the field this week have 20+ rounds at the course and the median number of prior rounds is 10. Among the notable favorites, Phil Mickelson has never played the Honda at PGA National, while Adam Scott has only 2 rounds. Because of the limited samples of prior performance here, there are hardly any golfers who have shown a statistically significant difference in their performance at PGA National versus in all other tournaments. I took each player’s 2007-2013 Honda Classic average performance and their average performance in all tournament from 2007-2013 (weighted by # of rounds played in a season so that if a golfer did not play in 2010, his 2010 performance did not factor into their overall average). I used a t-test to check for statistical significance. Only three golfers entered this week have played better or worse at a statistically significant level – Erik Compton (12 rounds, better), Geoff Ogilvy (4 rounds, better), and Will MacKenzie (16 rounds, better). It’s important to note that we would expect a similar number of golfers to be significantly better by chance alone. There’s simply not enough data for this tournament, at this venue, to make conclusive statements about how certain golfers over or under-perform here. More generally, I wondered whether PGA National fits a certain type of golfer’s game. Does it favor those who drive for distance? Or accuracy? I gathered individual player data for driving distance and driving accuracy for 2011 to 2013, standardizing the values to the average observed over both years. I then gathered corresponding performance in standard deviations from the mean for each player, stripping out their putting performance using each golfer’s strokes gained putting. For example, Michael Thompson was 1.48 standard deviations better than the field last year. 0.49 of that was from putting, meaning he played tee to green in ~1.0 standard deviation better than the field per round. I then regressed driving distance and accuracy on each golfer’s performance tee to green relative to the field. The results suggested that there’s a slight bias towards those who drive the ball longer at PGA National. Golfers who were above-average in distance/below-average in accuracy outperformed golfers who were below-average in distance/above-average in accuracy by 0.6 strokes/round, which is fairly significant. For all tournaments in 2013, +drivers/-accuracy outperformed -drivers/+accuracy by roughly 0.2 strokes/round. This suggests that driving for distance is more important at PGA National than in the average PGA Tour tournament. A regression based on only 360 rounds over three years is not airtight, but it does suggest PGA National is biased towards those who hit for more distance. I have a stat to measure the distance a course plays called True Distance. True Distance standardizes the length of each hole based on whether it’s a par 3, 4, or 5. This is necessary because the main factor that effects the listed length of courses is the number of this number of par 3 and par 5s. 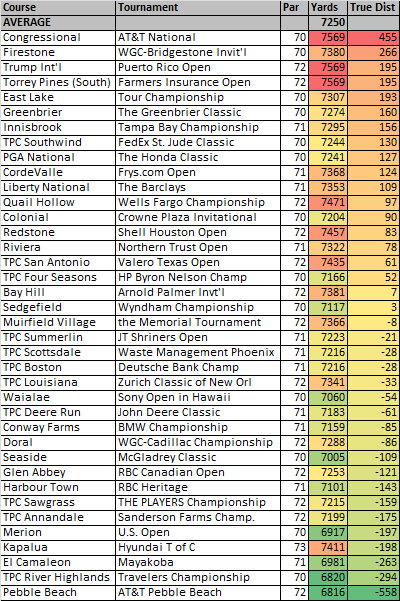 PGA Tour courses with only 2 par 5s play to 7177 yards on average, while those with 4 par 5s play to 7337 yards. That extra yardage doesn’t make those courses with extra par 5s more difficult. To find the True Distance of a course I compare the length of each hole to the average length of all PGA Tour holes of that particular par. The average par 3 on Tour is 198 yards, par 4 is 433 yards, and par 5 is 563 yards. A 500 yard par 4 is +67 yards in true distance while a 160 yard par 3 is -38 in true distance. I sum the true distance value for each hole to determine the course total. A table of course, tournament, scorecard yardage, and True Distance is below. Immediately it’s obvious why judging a course by its True Distance is superior. Kapalua, site of the season opening Tournament of Champions, is typically considered a bomber’s paradise, but it actually plays as one of the shortest courses on Tour once you factor in that it’s a par 73 with only 3 par 3s. It plays short because 8/11 par 4s and 3/4 par 5s are below average in terms of distance. Opposite of Kapalua are a half-dozen par 70 courses which play as some of the longest courses on Tour, despite having scorecard lengths considered roughly average. PGA National is one of those par 70s that plays much longer than it is listed. Eight holes play at least 20 yards longer than average, while only 4 holes play at least 20 yards shorter than average. That’s a major reason why this course has played an average of 6.7 strokes over par since 2007.